As he reiterated condemnation of the Saudi-US aggression on Yemen and the international silence over the nearly three-year-war, Hezbollah stressed that the outcome of Yemeni people’s steadfastness is the victory. Hezbollah’s Media Relations Office on Wednesday released a statement marking 1000 days since the Saudi-led aggression on Yemen. The Lebanese resistance party offered a review to the situation in Yemen since the start of the aggression in March 2015. “Throughout 1000 days of aggression three prospects have prevailed in Yemen,” the statement said. The first prospect was represented by savage crimes committed by the Saudi-led coalition which did not spare Mosques, hospitals, schools, markets or villages, Hezbollah said in the statement pointing out to the oppressive blockade on the impoverished country. The second prospect, according to Hezbollah, was the heroic steadfastness by the Yemeni people who are confronting the aggression with all means. Meanwhile, the Lebanese resistance group lashed out at the international silence over the crimes and massacres committed in Yemen. In this context, Hezbollah urged a halt to the aggression, stressing the importance of a political settlement. 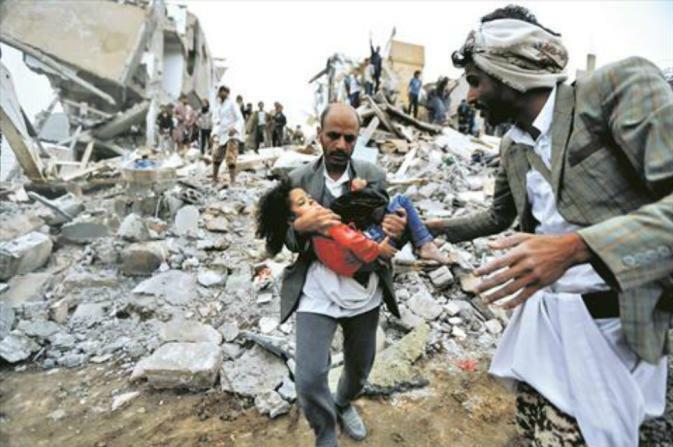 “We call on Muslim, Arab people to raise their voice in a bid to stop the humanitarian catastrophe in Yemen,” the statement said. Hezbollah saluted the courageous Yemeni people, voicing support to all those who have been confronting the Saudi-led aggression.